We are excited to announce a new version of the Star Realms app that adds real-time gameplay, the full Colony Wars expansion and a sleek new look. The newly-discovered outer worlds, with their rich, untapped resources, are tempting targets for those seeking to expand their power. Now, the scramble for control of these unclaimed territories begins. Will you outwit your opponents and claim your victory in the Colony Wars? This is the time that history records as the Colony Wars. Claim your riches. Establish your power. Rule the Realms! So what is coming in this new release? The new Star Realms app: a sleek new look & feel, real-time games, and easier to play for novice players! And the full Colony Wars expansion with 43 all-new cards! New one-click/one-tap zoom and lots of other fun features! Modern look and more space for your cards! Increased security – every move now logged with the server! The old interface served us well, but equipment must be upgraded if you’re going to explore the new frontier. We took feedback from all corners of the world, and our Digital Team built something pretty amazing. You’ll notice a cool rotating starfield. This can be turned off in the option screen if you’re so inclined. There’s also new music! We kept the old tune in there, but there are 5 more pieces in the rotation. 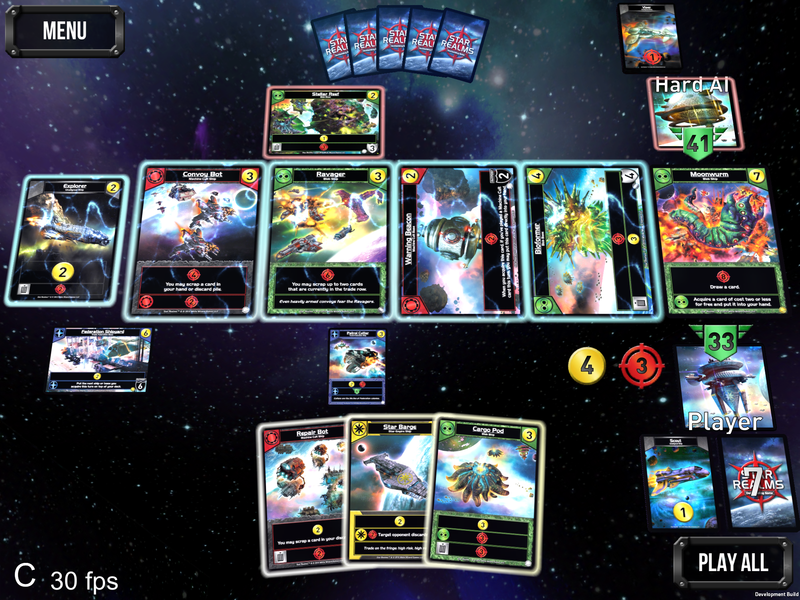 This is not your Grandmother’s Star Realms. With opponent discard effects still taking place when their turn starts, the previous version of Star Realms didn’t have a visual cue for the number of pending discards. Now it does! This quality-of-life change was a long time coming. The arrow on the opponent’s hand of cards says he’s going to be discarding two cards next turn. The 21 combat says he won’t even live that long. Another change that should help newer players, as well as help experienced players learn new cards faster, a single tap or click to zoom will replace the long press that we had in previous versions. If you are asked to select a card, you will still have to long press a card to zoom in on it (to keep selecting cards easy as well), but in all other cases – just tap a card to read it! Every turn, you start with 45 seconds on your clock (displayed in the top left of your screen), plus half the time you had left from last turn (with a minimum of 15 seconds, and a maximum of 45). This means you always have between 60 and 90 seconds to take your turn, and you get rewarded a bit if you play faster. On top of the starting clock, you also get a few seconds for every move you make, including discarding cards, activating bases, resolving events, etc. This way, if you need to make a lot of moves because you have a draw heavy deck, or a lot of events popped up, you won’t time out as long as you keep making moves. The moves will also be displayed in real time to your opponent, so your replay won’t be using their clock time. This also makes the games feel much more “real”, and makes it way more fun to stay in the one game. The new realtime games also require you to finish your game, or concede. You cannot play multiple realtime games at the same time, but unlike with 3 minute games, you probably won’t want to either. 48 Hour games will also display moves as players make them, but without the pressure of a short timer. Currently, we have a lot of players that are “Forever Fives” – stuck at level 5. This isn’t much fun, so now, if you make it to level 6, that will be your floor. If you then make it to level 7, that will be your floor, and so on. Sounds more fun, doesn’t it? However, it should be noted that now challenges won’t count towards your level or weekly or monthly leaderboards, but they will still count towards your overall number of games played, as well as your win percentage. We also made the Easy AI Level easier based on feedback from novice players. Haven’t been able to beat it? Give it another try! Cards that can be purchased from the Trade Row and can immediately be put into play or into a player’s hand. Blob faction has a new ability to “acquire a ship of cost x or less for free”. The Stealth Tower card that comes with Colony Wars allows you to copy any base in play! You’ll also gain access to two new chapters in the ongoing campaign, each with six missions! The story will allow the player to fill the shoes of real-life winners of the Star Realms Legend Series as they explore the Morgana System. The introduction to the story, Crisis Averted, can be found here. 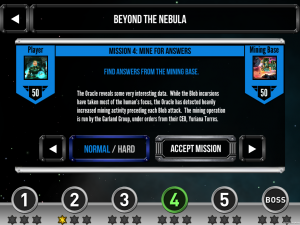 The new Star Realms app update is free (this does not include Colony Wars). The Colony Wars expansion is available for $4.99, purchasable through the app like any expansion. If you have any issues with installation or during play, please email [email protected] at any time! Great news! Looking forward to playing games with the new app! 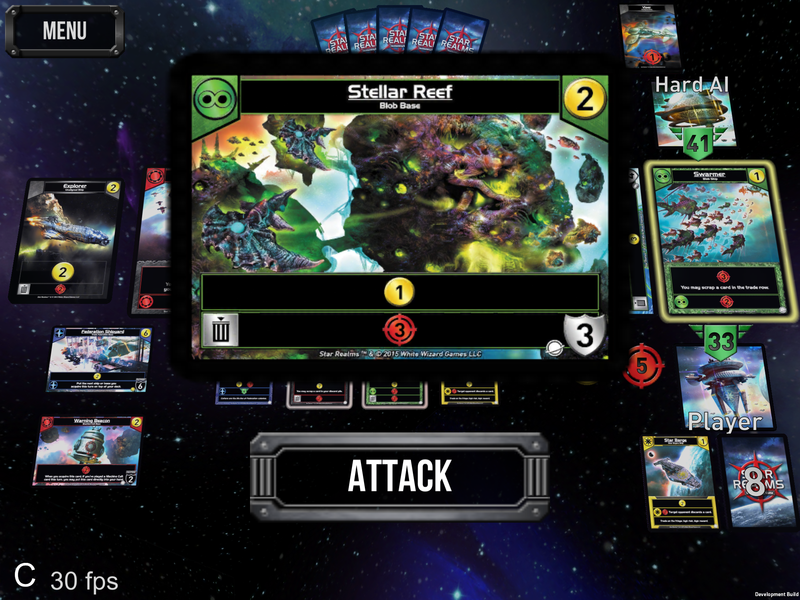 Star Realms is one of my favorite games from White Wolf! Can you play digital Colony Wars by itself without the base game deck? If you own the base game and Colony Wars, you can play with either or both. Does this include the PC/Steam version too? Yes all versions will be updated. What this doesn’t mention is what version of iOS is the minimum. On an iPad 1 with iOS 5.0.1 as the *maximum*, I am already locked out of all bar the first two expansions. Will this version on the iPad 1 at all? There are no technical details that I have found as yet. We have limitations from Apple on what we can support. I’m not sure of the answer for your specific device, I’ll check with the tech team. You can also play on Steam on a Mac or PC for no additional cost any expansions you have purchased. you can email [email protected] with your operating system/device details, we support the levels of iOS that are supported by Apple for new app updates. Still playing. Big fan. But frustrated by my level 5 and never getting further!! Can not wait till next week! Where is the chat and friend list ? This isn’t in the next update but we will note the requests for these features. Thanks for your feedback! “However, it should be noted that now challenges won’t count towards your level”. Why? That’s the whole point of the game for me! This is to prevent people from intentionally helping eachother increase levels by conceding. You got all those ‘farmers’ burned!!! Nice. Nonetheless, a farmer won’t really have what it takes against real advanced players. We found that the level system wasn’t very good for friends in general, as once you grew apart in levels, your levelling wouldn’t count either. We are working on different incentives for friends just playing via challenges – something better than a generic level that was trying to compare you against players playing random games online. What is considered a ‘Challenge’. I like to play games against random people and do rematches w/ them. I only play against two people that I know IRL. Challenges are any games started through the “Challenge” button, or challenges that you receive and accept, or rematches. This is amazing! Thanks for the update. Hoping for a friends list feature! ? Will it still be possible to play the game in pure 2d / top down mode? Any distortion makes it harder to view the cards properly. I second this. Giving the board a tilted effect sacrifices usability for the sake of shiny. There is no option to switch to 2D mode. The current slightly slanted mode actually fits more cards (you can now see more of your opponent’s bases). Also, due to changes to the sizes of cards in various zones, the cards in the trade row are slightly better readable. So do you need to have a newer version of android. We support the platforms supported by Google and Apple for new app updates. You can email [email protected] if you have questions about a specific device/operating system. will i be able to buy in pc, and play content in android too? i have steam wallet balance, i mean it waste to pay with credit card when i still have steam wallet balance. Yes you can buy on Steam and then restore purchases on your other devices. Will I be able to do the other way around, that is buy on Android and ply on Steam? Yes, you will be able to! Are there any plans to add multiplayer modes? Don’t have to be ranked, but using the rules included in the base physical game. I definitely second this, the chat and friends’ list too. Awesome stuff very excited – Chat and friends list next please! Will online games be gone as soon as the update hits, or as soon as we update the app? In other words, can people avoid updating the app and finish their games? Or will they be gone as soon as it goes live? Really looking forward to the update. Will it still have the autodraw, or can you choose to draw yourself, so you can topdeck and then draw instead of the other way around? Ally abilities will still activate automatically. This is unlikely to change as it adds a lot of clicking to the app. Hi! I am really excited for this expansion, as well as a lot of the play features. Are there going to be any thought given to multiplayer options? Pass and Play on my iPad Pro is pretty popular, but also getting online games going as well. I would love to have 4 or 6 player games going. Will we be able to turn off any expansions for quick match? I don’t want to go selective but I’d love to be able to present without, say, “events” so for quick matches I’m not forced to the max number of expansions I’ve purchased. That’s not an option in this update. Are there any future plans to add tournaments into the app? Are you going to fix the ally ability card draw? Per the rules, an ally ability, once available, should be able to be triggered at a chosen time during your turn; however, the app has always immediately activated ally card draw effects, often preventing an allowable (per the rules) combo or causing a premature reshuffling of the discard pile into a new draw pile. Also, speaking of reshuffling, should it not be allowed to not play all cards in your hand? Sometimes it would be beneficial to not play a card with a card draw ability at the end of your turn if it would cause a reshuffle, but the app gives no opportunity to end your turn before playing all cards. These two issues, in particular, make playing digitally quite different from playing tabletop, which is not a good thing. That’s a feature, not a bug. Having to manually activate ally abilities takes a huge amount of clicking, and slows down game play drastically. For a digital game, that’s not desirable. You can, starting with this update, end the turn with cards still in your hand by going to the in-game menu and pressing “end turn” there. Will it become possible to change the amount of starting authority in the future? With only 50, it often becomes hard to get your deck really rolling, before you have won. Longer games are more exciting. I got the cards also, both standard and Colony Wars, and playing with up to 200 authority often is more fun for my buddy and I. Would it be possible to add a timer to online 48h turn games? To see how much time is left. And possibility to skip turns if opponent is late? It’s something we can look into. We do send notifications to warn you when time is running out. Any idea if this will be coming out for SteamOS/Linux? You would think it wouldn’t be a major leap from Mac OS. This isn’t currently planned, but perhaps in the future. Will campaigns save from device to device? I find it very frustrating that just because I reinstalled the game on my new computer, all my progress in the last campaign was lost, and it also doesn’t count from phone to PC play. Once you’ve made progress in the campaign, press “sync online” in the campaign menu. That will upload your progress. Then, if you’re on a device with less progress, press that same button and it will pull down the progress that was made. Cool! How about hero realms? Will the AI finally kill us at the start of its turn if it’s able to? Right now it does all its trades and card playing first and it’s really annoying to have to wait for it to finish me off when I’m sitting there at 1 health and I know it’s doing 20+ damage. We made an easier AI, but I’m afraid not a less sadistic one. For people that have sunk money into all the current expansions, will their investment be carried into this new game? It’s not a new game, just an update. You’ll keep all your purchases! I was hoping to have a friend list to make challenges easier to start with those I play frequently. Maybe next time? ? Good work all. Hope the launch goes off without a hitch. It’s still on our to-do list. Maybe next time! 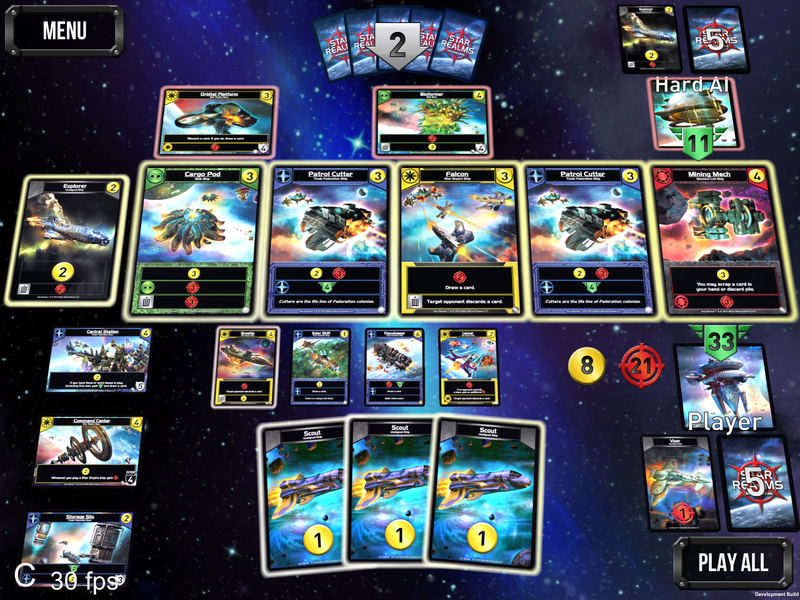 “This is not your grandmother’s star realms” – Really! Make sure you are on the updated version of the app. The version number should begin with a 4. I’m getting an error when clicking Play Online or Restore Purchases on iOS app. Is anyone else having this issue? Should I delete and re-download the app? We are having some issues on iOS with purchasing still. We hope it’ll get sorted soon. I’m sure you’re aware of the bug. Thought I’d drop a comment to mention them. We had some database/server issues, but those should be resolved now. I have to admit a bit of frustration that we saw Colony Wars come out in print in Q3 2015, while it’s only going digital in Q2 2017… but I’m excited to finally be able to play it with friends that don’t live in the same city. Please email [email protected] if you’re experiencing issues. GOOD JOB.. seeing the opponents turn in realtime is the most important feature, new graphics and music are also pretty. Colony Wars has many really cool cards. Please consider adding a feature to start with more authority than 50, perhaps 100. Also, please include stats that show win/loss ratio or amounts for other players. Would be good to see how a friend is doing overall and how you are doing vs each other. Lastly, the double tap to buy a card in the updated app isn’t working properly. I understand a single tap and then tap to confirm being necessary for newer players, but veterans will want the double tap feature please, especially for real time games where you’re against the clock. Also, are digital tournaments going to be implemented soon? In the Kickstarter, you mentioned they would be, but now, years later, still no digital tourneys. #2 was resolved by deleting and reinstalling the app. All of this is on iOS. 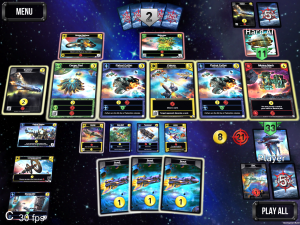 Star Realms fun is to beat your opponent, and that’s even better when it’s a friend, through a challenge. You removed part of the gaming experience now that beating a friend does not give any reward. Maybe have a way to create groups and rankings within these groups, so that we can still compete with friends? Fun update until I hit the campaign of Chapter 10: Colony Wars – Mission 1: Sensing Danger in Hard mode. I’ve tried so many approaches but the Empire ramps up too fast. If this were the last mission it wouldn’t be so bad but I’m afraid I’ll never to get to any of the others. Any clues on strategy or can you add a way to bypass this mission so I can play the others?